I went along. They went to Etts. But I went on down to Duncans. I had a pleasant call there I then came back up to Mrs Beechers and stopped awhile. And got over to Etts in time to go home with the folks. Kirt Hardy was out home all the afternoon. In the evening we all went to the theater Manford Shirts accompanying me.. The play was, "Ten nights in a bar room" It was the first time I ever saw it rendered, and taken into consideration the way I have felt on that subject the past two weeks I cant say I enjoyed so [it] very well. We got home about ten oclock and all were tired enough to go to bed. 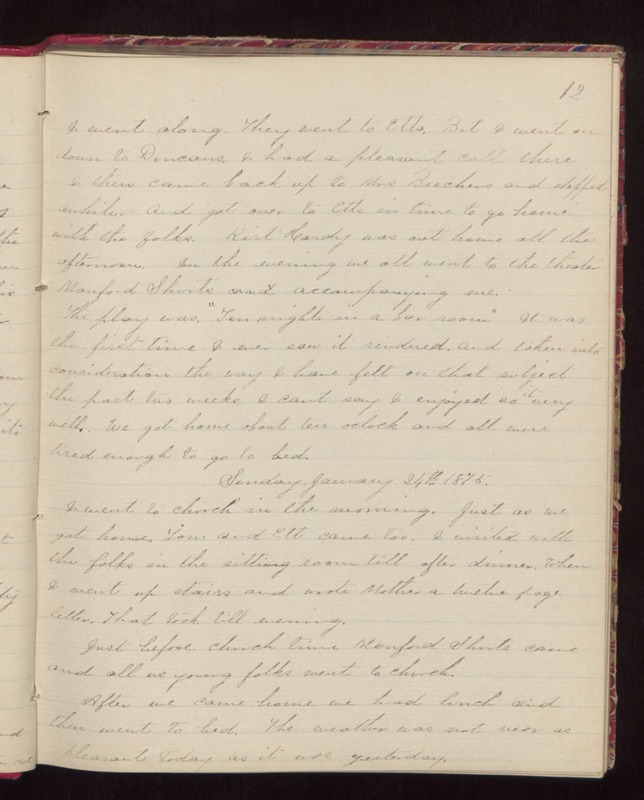 Sunday January 24th 1875 I went church in the morning, Just as we got home, Tom and Ett came too. I visited with the folks in the sitting room till after dinner. When I went up stairs and wrote Mother a twelve page letter, that took till evening. Just before church time Manford Shirts came and we young folks went to church. After we came home we had lunch and then went to bed. The weather was not near as pleasant today as it was yesterday.